Texas is home to a variety of species of beetles, specifically black beetles. The weather conditions, open land and crops filled with food draw them in but, at times, they are considered pests by Texas crop owners. However, beetles are ecologically beneficial to the environment, and some beetles are considered wood recyclers. 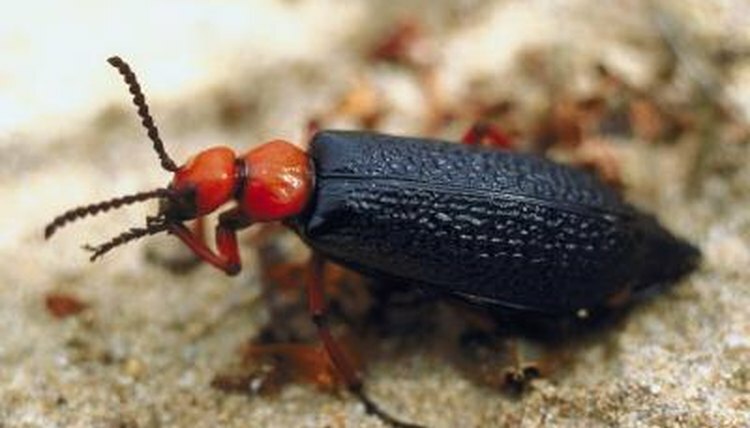 Black ground beetles are long-legged and are sometimes known to bite humans. They have pygidial glands in their lower abdomen that produces toxic secretions to deter predators. The beetle uses this defense mechanism when feeling threatened. While it is typically not a bite, the release of this toxic liquid can produce burning and pain to human skin. Ground beetles commonly live underground in passageways. They come to the surface to hunt for food sources such as worms, snails, ants and spiders. They are unable to fly because their wings are held together under their wing shields. There are more than 30,000 species of ground beetles worldwide. The American oil beetle, also known as the black oil beetle, is harmful to humans when physically disturbed. Belonging to the Meloidae family, these stubby bugs have shortened wing-pads and large abdomens. They're flightless and slow-moving beetles. Black oil beetles have traces of cantharidin in their blood and defend themselves by producing oil drops containing cantharidin from their joints, also known as reflexine bleeding. This poisonous secretion causes painful blistering to the human skin. The black stag beetle is also referred to as lucanus cervus, the largest terrestrial beetle. An adult grows to about 2 inches long. They're part of the Lucanidae family and are commonly referred to as "the pinching bug." They prefer rotting logs and dead tree trunks as their habitat and feed off sap and dead wood. They commonly eliminate dead wood from old trees and are known as "wood recyclers." They have intimidating large antler-style mandibles. Their bite is powerful and painful, drawing blood from beneath human skin. Black long-horned beetles are frequently found in a variety of hardwood trees. They grow to about an inch long and are a glossy black color with long antennae. The long antennae is visually intimidating and sometimes grows three times the size of the black long-horned beetle's body length. When physically disturbed it will bite humans, striking quickly, causing extreme pain and swelling for 24 to 48 hours.